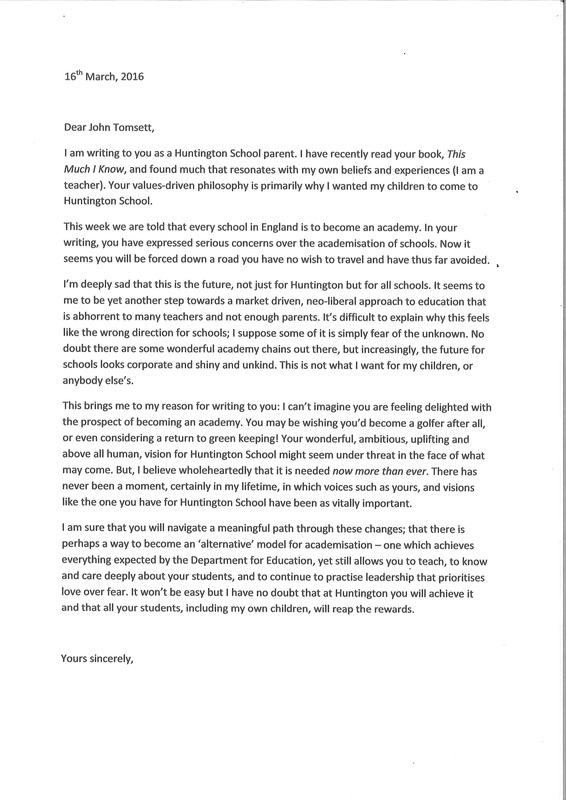 I have been a teacher for 27 years, a Headteacher for 12 years and, at the age of 51, this much I know about how one Huntington School parent feels about academisation. Hear hear! to that parent. No more do I want my youngest child, who is still in the system, to experience an education of ‘processing, packaging and despatching’ than I want to teach in such a regime. There has to be another way, a better way. One that strives for the best for every single individual child, a bespoke fit which will be different for EVERY single child. We really must not lose the heart from education, the reason why we are teachers. We must create a collaborative system that works for our students and communities. Above all, we must not lose sight of the child. Never.